It's been another letdown wax week for me! I think that's what I get for having a few good weeks in a row. I only had one winning wax this week. Majority of my disappointment this week wasn't with scent but was with throw. I did have some wax orders come in this past week so hopefully, the new stuff will be up to par! My Thoughts: This smells just like pine cones. It's blend of pine cones, pine needles, and some smokiness. It's an excellent outdoorsy scent that is very authentic and natural. It's not overpowering or heavy as some woodsy pine-like scents can get either which I appreciate. 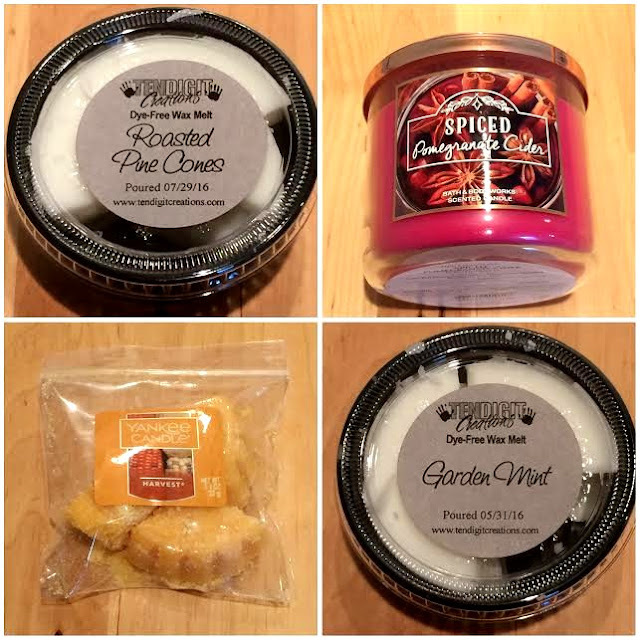 I wish there were more fall scents from other vendors and retail like this one. It's so hard to find authentic outdoorsy scents. My Thoughts: This didn't work for me. On cold sniff, I could pick up a blend of tart pomegranate and spice. When burned, I really got this creamy vanilla fruity smell and hardly any noticeable spice. There isn't anything spiced or cider about this scent in my opinion which is very disappointing. Scent Description: A blend of cinnamon, cloves, and musk with a hint of sweet apples and pumpkin. My Thoughts: This is the perfect quintessential fall scent. It's the perfect equal blend of all things fall spice, apple, and pumpkin. I LOVE LOVE LOVE this scent. It's my fall dream. However, the throw is absolute crap. I am so peeved, but I should have known better Yankee Candle tarts never really throw well yet I always try them again anyways. My Thoughts: This smells exactly like a fresh mint plant. It is so authenticly scented. I love this scent it's so crisp and refreshing and a great blend of herbal and earthy. However, again, the throw was not good. I really had to get close to it or breath in really hard to get a whiff of it. It surprised me because on cold it smells strong.